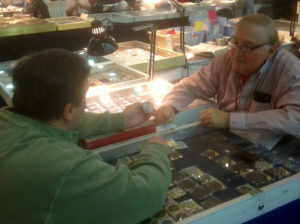 Karl Stephens, Inc. About Us - Karl Stephens, Inc.
Not long after Karl Stephens began collecting coins at the age of 11, he realized that he could sell some of the duplicate coins he found at the bank to other collectors for a profit. This lucky discovery enabled him to turn a hobby into a profession, and was the start of his long career as a coin dealer. After graduating from high school, Karl joined the Air Force. He was fortunate enough to be stationed in Europe for three years, where he learned a lot about foreign coins. After his discharge from the Air Force, he returned to Austria where he worked for the coin firm of Muenzhandlung Lanz in Graz. He worked there for six months as an apprentice, and continued to expand his knowledge of foreign coinage. While later working on his Bachelors and Masters degrees in International Marketing, he continued his connection with Lanz, acting as their U.S. agent, as well as selling foreign coins part time. In 1972, Karl accepted a position as Foreign Manager with Bowers & Ruddy Galleries of Hollywood, California. While working there, Karl had the opportunity to purchase and catalogue the important Stanislaw Herstal Collection of Polish Coins, and, shortly thereafter, the Henry Nagorka Collection of Polish Coins. This twist of fate enabled him to specialize in Polish coins, and for years he was one of the most significant Polish Coin dealers in the world. When Karl left Bowers & Ruddy in January, 1976, to start his own business, the department had grown to a total of six people, and he was the vice president in charge of foreign sales. Since then, Karl and his wife Joanne have had the good fortune to watch their business grow in size and to make many valuable friendships with collectors and dealers across the globe. In March of 2014, they published their 182nd full Price List, with an average of 1500+ coins ranging in price from $10 to several thousand dollars. In addition to these large lists, they periodically publish special price lists covering Goetz medals, Reformation material, Porcelain and other areas of specialty. 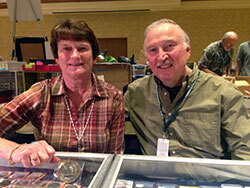 Karl and Joanne look forward to meeting new collectors through their Web site. Karl is always happy to discuss your collecting needs on the telephone or briefly answer your questions via e-mail. We are constantly in need of better World and U.S. coins. We will purchase individual coins with a retail value of $50 or more, or collections of groups of coins, as long as some of the coins meet our minimum Price List requirements of a retail value of $15 to $20 each. Please E-Mail or call us to discuss what you are considering selling. 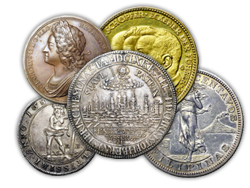 Some collectors have found consignment of coins to our company to be a valuable selling tool. When time is not a critical factor, the presentation of your better coins (usually $100 or greater in value) to our worldwide collector base, both on printed and electronic sales lists, can often generate an additional 5-20% return over an outright purchase. As opposed to an auction, where the starting price is low and you hope it goes higher, we can discuss the price at which you wish to sell your coins. Please call to discuss this further with Karl if you are interested. While we do not concentrate our efforts on Want Lists, over the years, countless collectors who have given us their Want Lists have been pleasantly surprised to hear from us regarding some coin or book they have been searching for! Why not give us a try. General European, including (but not limited to) Italy, France, etc. Reformation - we sell more coins and medals relating to Martin Luther and other Reformers than anyone in the United States. Please contact us for more information.